Rich and lush on the table, this coffee opens with scents of black currant, sweet tomato and fresh apricots. Full, round and as smooth as you could ask for, the body has a mouthwatering effect surrounding the juicy stone fruit flavors. Lush sweets come through like a fresh peach with honey, followed by soft tannins, nutmeg and a hint of savory herbs round out the experience. When all is said and done it lingers with a winey tannic glow, laced with cocoa and herbs. An informal gathering for coffee and conversation, simply stated, is what Klatch Coffee is. For the past 20 years Klatch Coffee has been serving up award winning coffee with great conversation. Based in Los Angeles, this family business started out of a love for great coffee with one retail store and has evolved into a global wholesale roaster and retailer with its coffee featured daily on three continents. 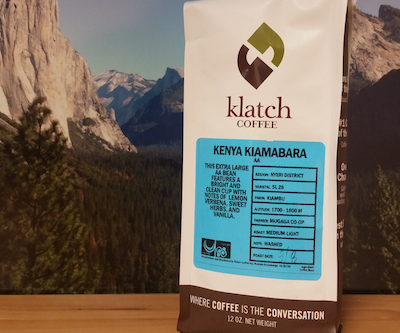 Klatch coffees are born as a result of nurturing relationships with the farmers who grow the beans. It is our belief that the art of Klatch begins right where the seeds are planted. Green buyer and roast master Mike Perry painstakingly travels the globe to ensure that we have the rst look at the nest results of each harvest. Our commitment to honest business practices means we build trust and loyalty with the farmers we work with. All of this is accomplished through a Direct Trade model and a simple handshake. That's the way we do business. Categories: Coffee Ratings. Origins: Kenya. Flavors: Apricot, Black Currant, Floral, Full Body, Honey, Light Caramel, Mouth-Watering, Nutmeg, Peach, Round, Smooth, Sweet Tomato, and Tannic Fruit. Brew Descriptors: Bright, Complex, and Juicy. Roasters: Klatch Coffee.